. This magnificent structure, crafted and sculpted to create a moving experience for those who view it, is one of the most impressive jewels of the Park. The $300,000 donation by Sony Music makes possible the realization of a dream to complete the "Shadow Wave Wall" and will serve as one of the focal points in the Park. We would like to thank Sony Music for this enormous contribution, demonstrating their continued dedication to the legacy of Jimi Hendrix. “This beautiful park will provide a welcoming and inspiring community gathering space as well as a place for fans of Jimi’s music to celebrate his indelible contributions to the music world,” said Hendrix, the sister of the legendary guitarist, who has been involved since the planning stages. "Seeing the work in living color, now tangible and not just on paper or a drafting board, is like hearing Jimi's music for the first time. It's overwhelming." Located at 2400 S. Massachusetts St., adjacent to the former Colman School that now houses the Northwest African American Museum, the new park fits in beautifully with the cultural essence of the area. The park features a grand entrance and stairway adorned with Jimi’s signature at the corner of Massachusetts and 25th Avenue South, lending convenient access. A walkway toward the central plaza incorporates a timeline of Jimi’s life and career embedded in the pavement, making it historical and educational. In keeping with the musical emphasis, lyrics from the iconic Hendrix songs “Angel” and “Little Wing” are etched into a purple ribbon along the timeline. But the creativity doesn't end there. New plantings of trees and flowers decorate the terrain, as well as four rain gardens with native plants and a butterfly garden with flowering shrubs to improve environmental sustainability. Jimi Hendrix Park and NAAM Wayfinding Signs Installed! 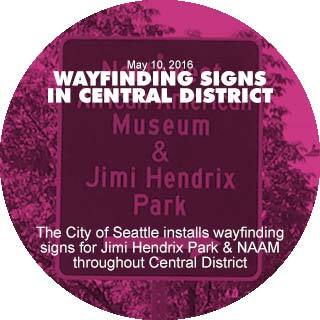 After several months of advocacy, wayfinding signage to the Northwest African American Museum (NAAM) and Jimi Hendrix Park were installed at multiple locations in Seattle’s Central District. On Tuesday, May 10, 2016 representatives from NAAM and the Jimi Hendrix Park Foundation unveiled the signs to the public at the junction to MLK Jr. Way and S. Massachusetts Street. Supporters of this effort include: the Friends of Jimi Hendrix Park, the new Historic Central Area Arts and Cultural District Council, the Office of Arts and Culture and SDOT. “There are times when you open your eyes and see a beautiful vision realized...this is one of those times. It gives us pure joy and a sense of divine purpose to arrive at this moment. We are living out the dream of Jimi Hendrix to create a lasting experience for the world to enjoy! So enjoy..,” says Janie L. Hendrix, Founder/Director of Jimi Hendrix Park Foundation. Construction of Jimi Hendrix Park is nearing the final stretch. Seattle Parks and Recreation contracted with ERRG, Inc. to transform Jimi Hendrix Park in Seattle’s Central District into a celebratory space worthy of its namesake, hometown rock icon Jimi Hendrix. The 2.5-acre green space, located adjacent to the Northwest African American Museum, will come to life throughout the summer and is scheduled to be completed by end of August. “Increasing the accessibility to important sites that illustrate the richness of African American culture and heritage in the Central Area, is a significant boost for further solidifying our Historic Central Area Arts and Cultural District,” noted Vivian Phillips, Co-Chair of the districting effort. As new places of historic significance come on line, we will anticipate that this level of demarcation will enhance our ability to lead people to these cultural places, while we continue to create even more spaces for artistic and cultural enhancements,” she also noted. Seattle, WA – 99.9 KISW, The Rock of Seattle, is proud to continue its partnership with the Jimi Hendrix Park Foundation again to help raise fund the development of the new Jimi Hendrix Park in Seattle's Central District. The KISW/Jimi Hendrix shirt will be sold exclusively through the Rock Shop at KISW.com. The park will boast many unique features, including the curved shapes of a guitar, an extended shadow wave wall featuring Jimi Hendrix's image, and a central canopy. 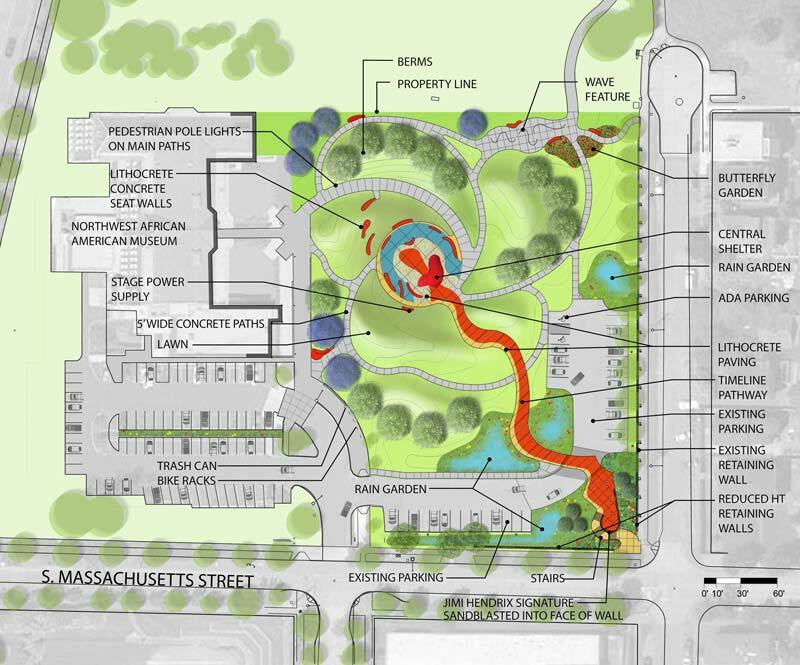 The Jimi Hendrix Park Foundation has already raised an excess of $1.4 million of the estimated $1.8 million dollar budget needed to complete the park's design and construction phases. Construction progress recently passed the 80% mark as the park's anticipated completion draws closer (the projected date being later in 2016). 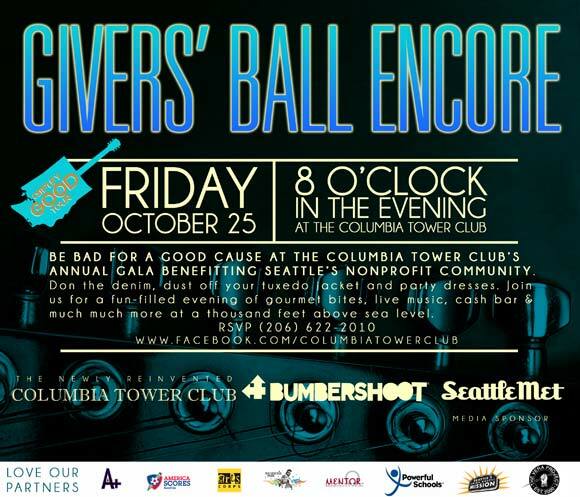 KISW hopes that through the sale of the shirts, where all net proceeds will go towards this fundraising, the foundation will get even closer to meeting this goal. Jimi Hendrix's music has been crucial to the fabric of KISW since its inception 45 years ago. "Purple Haze" was the first song The Rock played after switching from its previous classical format. KISW believes that Jimi Hendrix's influence and memory should live on in and benefit the community that helped shape Jimi's music, and by extension, their radio station. 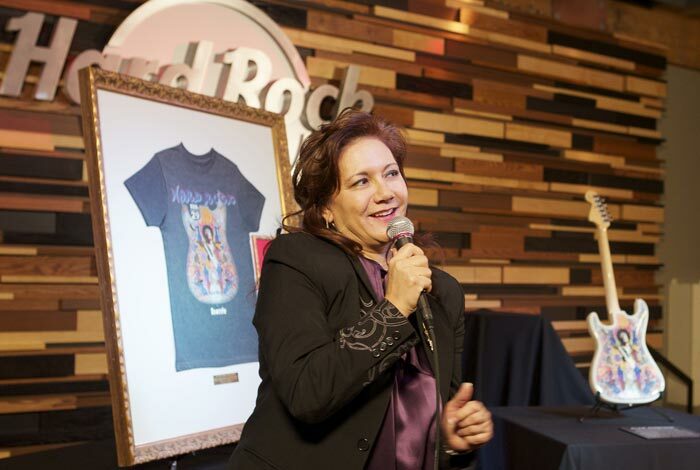 Dave Richards, KISW VP of Programming, said: "We're humbled and proud to continue our partnership with Janie Hendrix and the Jimi Hendrix Park Foundation and their commitment to the legacy of Jimi and the city of Seattle." "Our family and the Jimi Hendrix Park Foundation are honored by the continued relationship with KISW, The Rock of Seattle. For more than four decades, Seattle's legendary music station has continuously supported our 'West Coast Seattle Boy' and global icon, Jimi Hendrix," commented Janie L Hendrix, President/CEO of Experience Hendrix, L.L.C. and Founder/Director of The Jimi Hendrix Park Foundation. 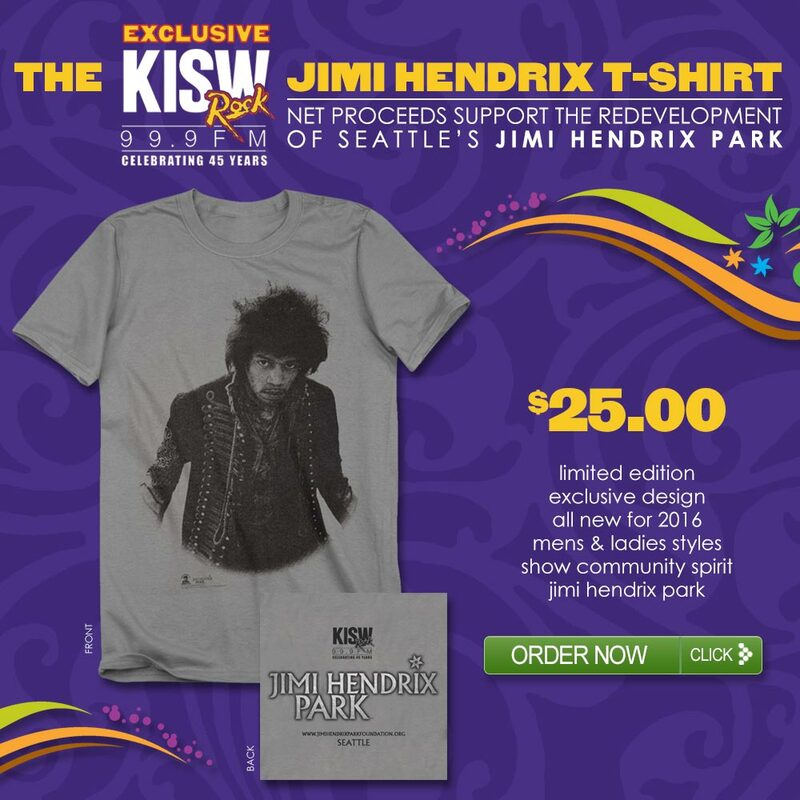 "These new designs are the latest in a series of KISW/Jimi Hendrix Park branded products that present a real win-win situation where listeners have the opportunity to get a really cool, limited edition t-shirt and proceeds help complete Jimi Hendrix Park. We couldn't be happier!" Entercom Communications Corp. (NYSE: ETM), is the fourth-largest radio broadcasting company in the United States, with a portfolio of 125 highly-rated radio stations in 27 top markets across the country. Known for developing unique and highly successful locally programmed stations, Entercom's brands reach and engage close to 40 million people each week, delivering a curated mix of outstanding local personalities and a broad range of compelling music, news, talk and sports content. The Jimi Hendrix Park Foundation was formed to help create a community space inspired by the electrifying music and story of Jimi Hendrix. To create a gathering place for individuals of diverse backgrounds and ages to celebrate cultural heritage, experience community pride, and enjoy innovative educational programming. 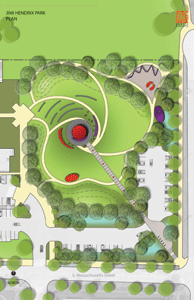 JIMI HENDRIX PARK CONTRACTS TO ERRG, INC.
SEATTLE, WA — March 19, 2015 — After four years of planning and fund-raising, Jimi Hendrix Park took a major step closer to realization with the winning rebid of the development to ERRG, Inc. The City of Seattle is pursuing a contract with the company. ERRG, Inc. was chosen from among five bidders to transform an open green space in Seattle’s Central District into a celebratory space worthy of its namesake, hometown rock icon Jimi Hendrix. Construction at the 2.5-acre park, located adjacent to the Northwest African American Museum, is expected to begin in April, with opening of the new park features projected this fall. "The Jimi Hendrix Park is the culmination of years of hard work, collaboration, creative input, and generosity invested in something we all believed in and constructed to commemorate an amazing human being. It is our hope that for generations, it will exist as more than an attraction or point of interest, but a place of homage to one of Seattle's own. The landscaping, the artistic design, and the ambience all mimic the vibe of the persona of Jimi, whom this park honors," says Janie L. Hendrix, Founder and Director of Jimi Hendrix Park Foundation. Following a year-long public design process, the non-profit Jimi Hendrix Park Foundation and the Friends of Jimi Hendrix Park launched a capital fund-raising campaign in 2012 that raised more than $1.4 million to finance construction of the first phase in a two-part project. The park plan aims to create an engaging space that celebrates the life, music and legend of Seattle native Jimi Hendrix. Phase 1 of the park development, designated "Little Wing," will include a new stairway and grand entrance at the southeast corner of the park at 25th and Massachusetts, paved pathways, a chronological timeline of Jimi's life and career, enhanced landscaping with trees and native plantings, seat wall benches, improved fencing, ADA accessible walkways, rain infiltration gardens, a butterfly garden, and a central plaza for community gatherings and performances. "The Northwest African American Museum looks forward to the opening of the new Jimi Hendrix Park. Together we form a premier cultural destination that celebrates African American art, history and culture, and the living legacy of an iconic musician who helped the world expand its definition of "black music" and continues to influence musicians today," remarks Rosanna Sharpe, Executive Director of the Northwest African American Museum. Fund-raising continues to construct phase 2 of the park project including: additional pathways, pedestrian lighting, improved fencing, the installation of a central shelter and the centerpiece feature, a "shadow wave wall" depicting iconic silhouette images of Jimi Hendrix. The unique landscape design by Murase Associates of Seattle is expected to draw visitors from around the world as well as to serve as a local neighborhood gathering space. Major donors to phase 1 of the park project include: Hard Rock International, Parks and Green Spaces Opportunity Fund, Seattle Department of Neighborhoods, Janie L. Hendrix, King Conservation District, Seattle Parks Foundation, KISW 99.9 FM, Northwest African American Museum, Nisqually Indian Tribe and Fender Musical Instruments Co. The mission of the Jimi Hendrix Park Foundation is to create a community space inspired by the extraordinary life and electrifying music of Jimi Hendrix — a gathering place for individuals of diverse backgrounds and ages to celebrate cultural heritage, experience community pride, and enjoy innovative educational programming in partnership with the neighboring museum. The park plan envisions a space that will motivate youth and others to explore music and art, and strengthen the cultural pulse of the Emerald City as a primary focal point for multi-cultural events, gatherings, and activities for the community. Your generous donation can help shape the future of Phase 2 of Jimi Hendrix Park, please visit: www.jimihendrixparkfoundation.org. 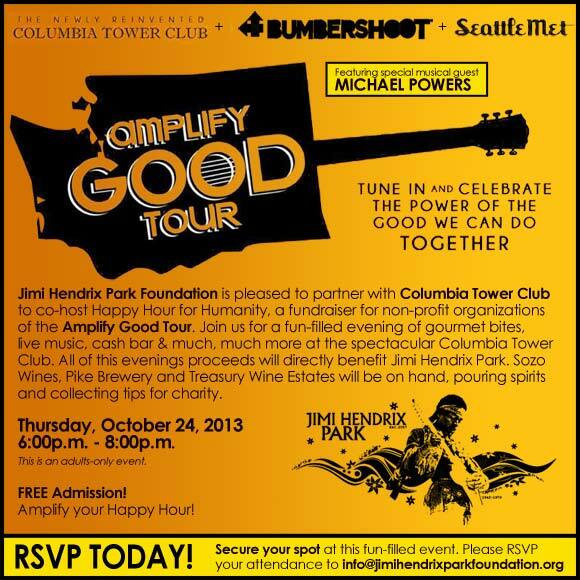 The Jimi Hendrix Park Foundation is a 501(c)3 registered public charity (EIN 27-3599916). Seattle, WA - November 19, 2014 - The Jimi Hendrix Park Foundation, The Friends of Jimi Hendrix Park, and King County Metro Transit unveiled the Jimi Hendrix-themed bus shelter at the 23rd Avenue and Massachusetts Street intersection as part of its ongoing bus shelter mural program. Hendrix’s sister Janie Hendrix, Experience Hendrix L.L.C. CEO, presided over the ceremony on Wednesday. She commented, "Having his image placed on this shelter is a moving tribute to Jimi and an honor to the Hendrix family. This is yet another way of recognizing Jimi for his contribution to this city, and the mark he made on the world. We are deeply appreciative." Jimi Hendrix Park and the new Metro stop shelter are located in the heart of Seattle's vibrant Central District, a thriving multi-cultural community rich in heritage. Nestled adjacent to the Northwest African American Museum. Seattle, WA - November 10, 2014 — The Jimi Hendrix Park Foundation and The Friends of Jimi Hendrix Park are giving the City of Seattle its next great landmark. You are invited to attend a pre-birthday commemoration for Jimi Hendrix and the unveiling of a Jimi Hendrix themed bus shelter. Join us for a celebration of Jimi's profound legacy and of the cultural and musical heritage of Seattle's Central District. The ribbon cutting and unveiling will take place at 11:10 a.m.
Seattle, WA - June 7, 2014 — Jimi Hendrix Park Foundation and the family of Jimi Hendrix are deeply saddened to learn of the passing of Peter S. Shukat. Mr. Shukat, founding partner with New York based Shukat Arrow Hafer Weber & Herbsman, LLP, has served as lead counsel to the Hendrix family companies including Experience Hendrix, L.L.C., Authentic Hendrix, LLC, Jimi Hendrix Park Foundation, and JMH Productions, LLC among others for more than 20 years. 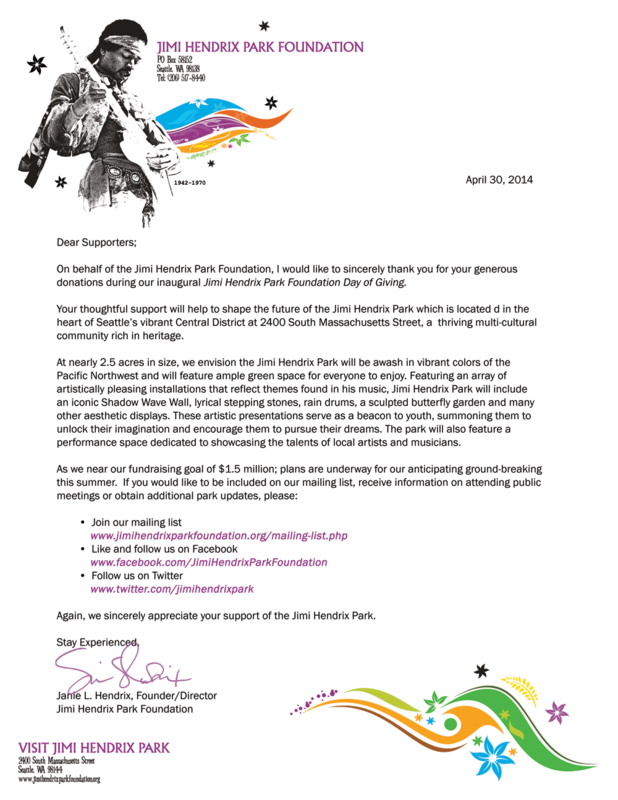 Seattle, WA - April 30, 2014 — On behalf of the Jimi Hendrix Park Foundation, I would like to sincerely thank you for your generous donations during our inaugural Jimi Hendrix Park Foundation Day of Giving. Your thoughtful support will help to shape the future of the Jimi Hendrix Park which is located in the heart of Seattle’s vibrant Central District at 2400 South Massachusetts Street, a thriving multi-cultural community rich in heritage. 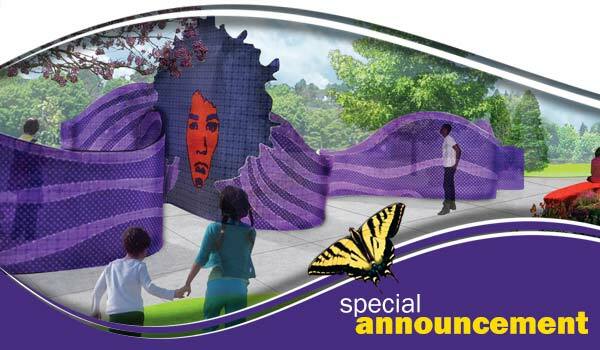 The Jimi Hendrix Park Foundation is pleased to announce a new fundraising effort to support the construction costs of a public art structure, the Shadow Wave Wall, at Seattle's Jimi Hendrix Park, located adjacent to the Northwest African American Museum (NAAM) in Seattle's Central District. 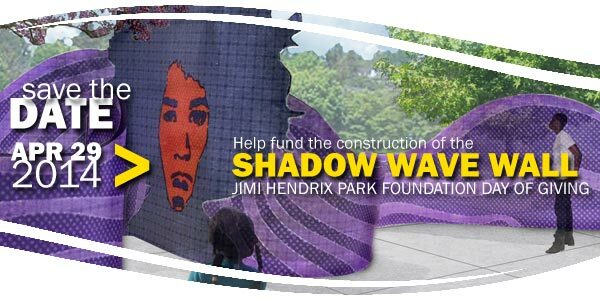 All funds raised during the "Jimi Hendrix Park Foundation's Day of Giving" on Tuesday, April 29, 2014 will be used to help fund the construction of the iconic Shadow Wave Wall in Jimi's image. Evoking imagery of sound wave patterns, this brightly colored, curved steel art structure will measure in excess of 94 feet in length. Featuring cut-out silhouettes of Jimi Hendrix performing in concert, these dynamic forms embrace the energy felt in Hendrix's music. As the sun passes overhead, the carved structure will cast long inverted shadows of Jimi Hendrix on the ground that will continually move in the setting sun. Varying in height between 4 and 12 feet high, the highest section will feature a large portrait of Jimi Hendrix which will be highly visible from the central plaza. The Shadow Wave Wall will also serve as a prominent gateway feature for those accessing the park from the north, which connects to Sam Smith Park, the I-90 trail, and a future Rainier Light-Rail station. The Jimi Hendrix Park Foundation is a 501(c)(3) registered public charity (EIN 27-3599916). Secure tax-deductible online donations to the "Jimi Hendrix Park Foundation's Day of Giving" can be made at www.jimihendrixparkfoundation.org/support. As ground-breaking nears this summer, we are in the final stages of fund-raising. Your contribution is essential to help transform this 2.5-acre park in a historically under-served part of Seattle into a space as innovative and inspiring as its namesake. Thank you for joining us during this special fundraising event. 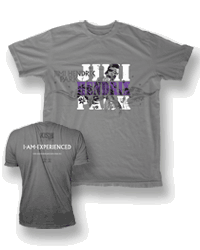 The Jimi Hendrix Park Foundation and capital campaign is spearheaded by Janie L. Hendrix, who also serves as President/CEO of Seattle-based Experience Hendrix L.L.C. To make a tax-deductible contribution, please visit the Jimi Hendrix Park Foundation website, www.jimihendrixparkfoundation.org. 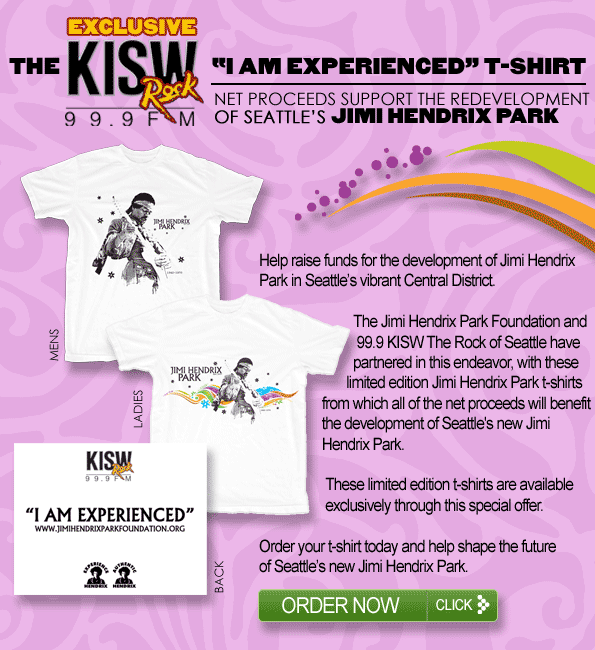 Purchase the limited edition 2014 KISW/Jimi Hendrix Park t-shirts to help support the development of Jimi Hendrix Park. Proceeds from the sale of each shirt will go towards the construction efforts. November 26, 2013 - Shop Today! October 24, 2013 - One Night Only! Learn more at the Columbia Tour Club website or visit them on Facebook. October 25, 2013 - One Night Only! Jimi Hendrix Park @ Bumbershoot 2013! 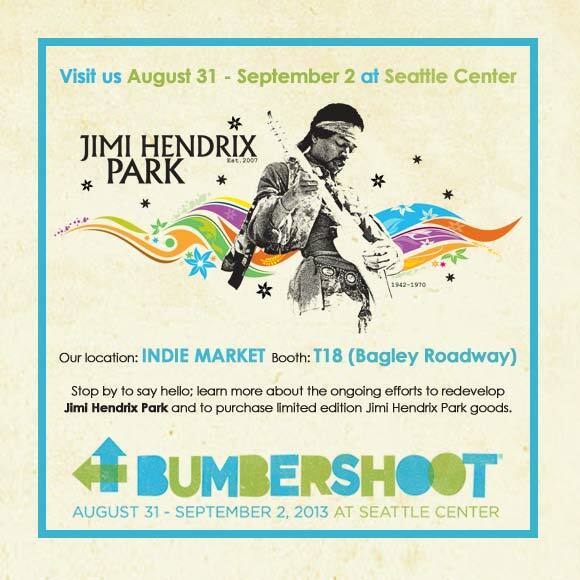 Jimi Hendrix Park Foundation will be on site at this year's Bumbershoot festival at Seattle Center from August 31 - September 2. Be sure to stop by our booth (#T18) in the INDIE MARKET section near Bagley Roadway. Help support Jimi Hendrix Park now through your online donation via The Seattle Foundation, or learn more about this special fundraising campaign and some of the bonus perks that are potentially available to supporters who donate today. On April 10, 2013, the Jimi Hendrix Park Foundation delivered a check in the amount of $484,351.58 to Seattle Parks and Recreation in support of the redevelopment of Jimi Hendrix Park in Seattle. This most recent contribution was a culmination of numerous individual fundraising efforts spearheaded by the Jimi Hendrix Park Foundation over the past several months. 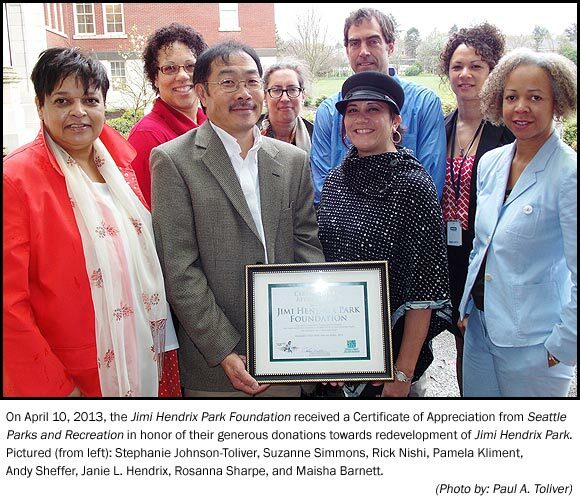 In marking this auspicious occasion, Seattle Parks and Recreation recognized the Jimi Hendrix Park Foundation for their substantial fundraising efforts to support the redevelopment of Jimi Hendrix Park. "We are extremely honored by the support that the community and our partners have shown for Jimi Hendrix Park," explained Janie L. Hendrix, Jimi Hendrix's sister and Founder of the Jimi Hendrix Park Foundation. "To date we have raised in excess of $1 million en route to our goal of $2.1 million. As we approach our intended goal, we hope to break ground on the new Park this fall." Fundraising efforts are still ongoing and community supporters and fans of Jimi Hendrix are encouraged to help make this lasting monument to Jimi Hendrix's legacy a reality. 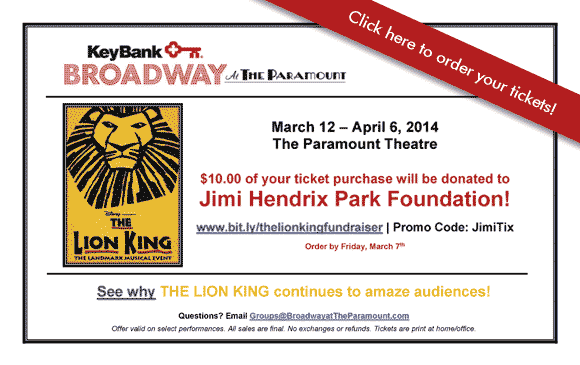 Tax-deductible donations can be made through the Jimi Hendrix Park Foundation website. SPECIAL EVENT: Don't miss this opportunity to see FELA!, the hit Broadway show playing May 28 - June 2 at The Paramount in Seattle. By purchasing your show tickets through this exclusive link, $10 for each ticket sold will be donated to help Jimi Hendrix Park. Follow us on Facebook or Twitter and join our mailing list. 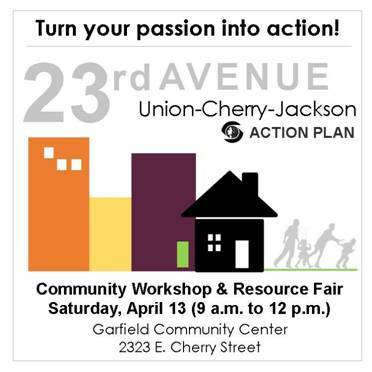 The Jimi Hendrix Park Foundation will be on site at the 23rd Avenue Action Plan Community Workshop & Resource Fair this Saturday, April 13, 2013 (9 a.m. to 12 noon). We invite you to visit our informational booth to learn more about the Jimi Hendrix Park and our fundraising efforts. 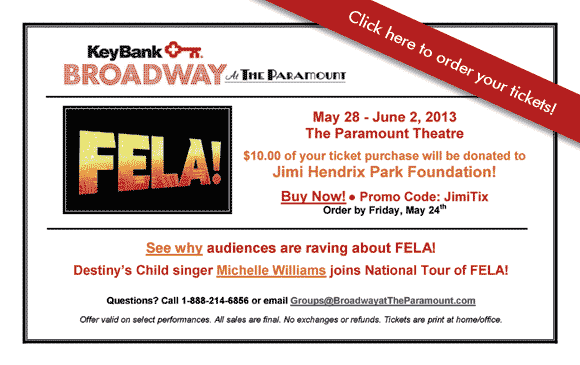 Click to order tickets | Learn more about FELA! The Jimi Hendrix Park Foundation (JHPF) recently announced impressive gains in fundraising for development of Seattle's Jimi Hendrix Park, located adjacent to the Northwest African American Museum in the City's Central District. Recent donations to the park include an award of $100,000 from the Department of Neighborhoods, Neighborhood Matching Fund (Large Projects) for general construction; $79,040.47 from JHPF's partnership with Hard Rock International for the sale of Jimi Hendrix T-shirts (bringing Hard Rock's total contribution in 2012 to $425,734); $40,970 from King Conservation District to fund the park's rain gardens; and $10,000 each from the Nisqually Indian Tribes and Fender Music Instruments Company, for general construction. Project Manager Maisha Barnett expressed her gratitude for the community's enthusiastic support of the Park: "We are so thankful for the on-going contributions made by both our institutional partners as well as our individual supporters. Their commitment will enable us to turn the dream of Jimi Hendrix Park into reality." Throughout 2012 JHPF pursued a capital fund-raising campaign to finance construction of the park that will celebrate the extraordinary life and musical legacy of Seattle's native son, Jimi Hendrix. The non-profit foundation, with the assistance of the Friends of Jimi Hendrix Park, a volunteer community group committed to developing the space, aims to raise $1.5 million in private funding to supplement a $500,000 Seattle Parks Levy Opportunity Fund Grant. The park plan envisions a space that will motivate youth and others to explore music and art, and strengthen the cultural pulse of the Emerald City as a focal point for multi-cultural events, gatherings and activities for the community. The Jimi Hendrix Park Foundation and capital campaign is spearheaded by Janie L. Hendrix, who also serves as President/CEO of Seattle-based Experience Hendrix L.L.C., and Carver Gayton, Executive Director Emeritus of the Northwest African American Museum. Despite its recent successes, the Foundation has not yet reached its fund-raising goal of $1.5 million in private donations and continues to seek community assistance in its efforts. Contributions to the foundation are tax deductible. For more information, or to support the cause, visit www.jimihendrixparkfoundation.org. At the core of the Park project is the belief — embodied best by Jimi Hendrix himself — that with talent, hard work and passion, anything is possible. Good morning, everyone. I hope your day's going well so far. Having gotten the first of today's reviews out of the way early, I thought I'd get into some entertainment news. This morning, I've got some news about a fundraising effort established to help pay for a park dedicated to the memory of rock legend, Jimi Hendrix. Read on! Janie L. Hendrix, Founder/Director of The Jimi Hendrix Park Foundation was interviewed this morning by KOMO News Radio. Click the icon below to listen. Hard Rock International is honored to launch the brand's Jimi Hendrix Signature Series: Edition 29 merchandise in Jimi Hendrix's hometown of Seattle. On Thursday, February 9, 2012, Hard Rock Cafe Seattle will celebrate the program launch by unveiling a special memorabilia collection dedicated to the hometown legend. Jimi Hendrix Designed Fender Stratocaster – A Fender Stratocaster featuring a visual representation of the music legend's most recognizable songs on a guitar image designed collaboratively in 1970 by Hendrix and artist Alan Aldridge, creator of Hard Rock Cafe's iconic logo. 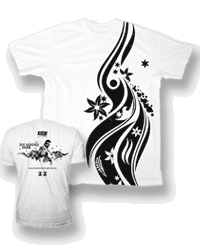 The piece serves as the design inspiration for Hard Rock's Jimi Hendrix Signature Series: Edition 29 T-shirt. Jimi Hendrix Boots – A pair of boots worn by Jimi Hendrix circa 1967-69 during performances at the Salvation Club in New York. Jimi Hendrix Custom Gibson Flying-V – A custom Gibson Flying V that was commissioned by Jimi Hendrix in 1969. Hendrix reportedly referred to this guitar as the "Flying Angel", but to most guitar aficionados, it's forever identified as the "Red House" guitar. It's one of three Flying Vs Hendrix owned. Experience Contract – A five page contact for the Jimi Hendrix Experience and Bill Graham regarding performances at The Fillmore and Winterland Ballroom in San Francisco in 1968. Jimi Hendrix Song Writers Contract – A contract between RSVP Music and "Jimmy" Hendrix for the song "No Such Animal," dated June 21, 1966, prior to Hendrix changing the spelling of his first name. The special collection complements additional pieces currently on display at Hard Rock Cafe Seattle. 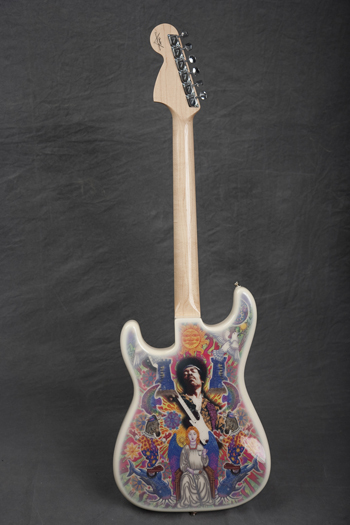 Jimi Hendrix 1969 Fender Stratocaster – The 1969 Fender Stratocaster guitar played by Jimi Hendrix during '69 and '70, while with the Jimi Hendrix Experience and the Band of Gypsies. This tobacco burst-finished guitar has a white pickguard and a 22-fret maple fingerboard with 10 mother of pearl dot inlays. The instrument still has its original tremolo arm. Jimi Hendrix Purse – A purse that belonged to Jimi Hendrix and was used to carry lyric sheets, guitar picks, extra bandannas, etc. Hendrix/Isley Brothers Photo – A photo of Jimi Hendrix and the Isley Brothers with Curtis Knight from Hendrix's time with the group in 1965. Jimi Hendrix toured with the group on and off for about a year, and he even recorded singles with them, the most famous of which is a two-part jam called "Testify". Jimi Hendrix Shirt – A simple blue pullover from Jimi Hendrix's wardrobe, exemplifying the Hendrix "electric gypsy" look that became such a huge part of late-‘60s iconography. Jimi Hendrix Hat – A hat with a quintessential ‘60s floppy brim worn by Jimi Hendrix during the late 60's. "We are delighted that Jimi is playing such an important role in supporting multiple worthy causes," said Janie Hendrix, sister of Jimi Hendrix. "It would warm his heart to know that his legacy is being honored this way, continuing to have an impact on the entire universe. At Authentic Hendrix, we're working to fulfill his vision. Joining our long-term partners Hard Rock International and The Fender Foundation allows us to continue to shape and inspire our communities through music." Hard Rock's Jimi Hendrix Signature Series: Edition 29 T-shirt is inspired by a one-of-a-kind guitar, displayed in the collection that was conceived by Hendrix and commissioned to commemorate the Hard Rock's 40th Anniversary in 2011. Jimi Hendrix Signature Series: Edition 29 limited-edition Pin is modeled after the Fender Stratocaster Guitar Jimi Hendrix played onstage during his iconic Woodstock performance in 1969. The limited-edition merchandise is available in stores and online with 15% of the retail price benefiting The Fender Music Foundation and Seattle's Jimi Hendrix Park Foundation. The one-of-a-kind collection will be on display at Hard Rock Cafe for public viewing from Thursday, February 9, 2012 until Thursday, March 1, 2012. The memorabilia display will then go on the road and will be on site at Hard Rock locations during the 2012 Experience Hendrix Tour, including March 13th (Orlando, FL) and March 14th (Hollywood, FL). For additional information please visit www.hardrock.com. 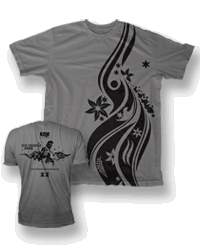 Hard Rock International honors legendary guitarist Jimi Hendrix with the launch of the brand's Jimi Hendrix Signature Series: Edition 29 pin and T-shirt, featuring a visual representation of the music legend's most recognizable songs, conceived by Hendrix himself and relayed to Alan Aldridge, famed artist and creator of the iconic Hard Rock Cafe logo. Please join us at a Design Development meeting for Jimi Hendrix Park. Murase Associates facilitated three public design meetings over the Summer of 2011 to create a Schematic Design, and now we would like your input and support for the future development of the park. 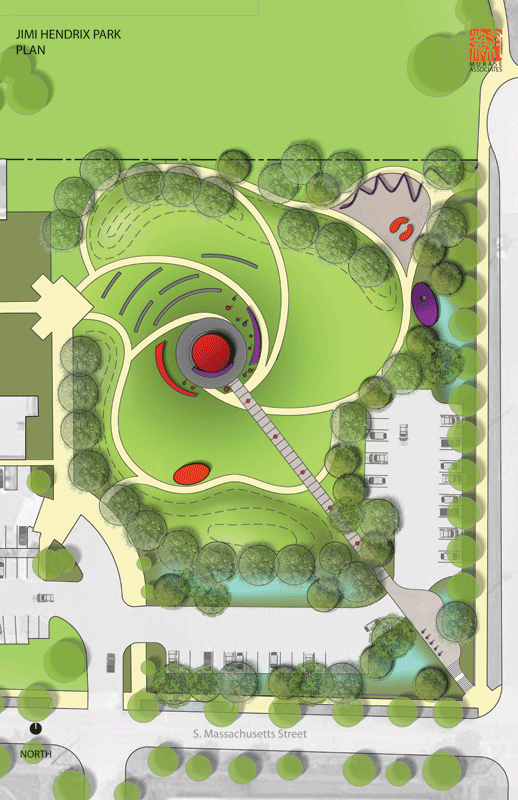 Members of the Friends of Jimi Hendrix Park, Murase Associates, and Seattle Parks Department staff will be available during the meeting to discuss the design, fund raising events, and community volunteer opportunities. Eddie Rye Jr., host of Urban Forum Northwest radio show on Seattle's KKNW 1150AM dedicated his Friday, June 17, 2011 program to Jimi Hendrix Park. 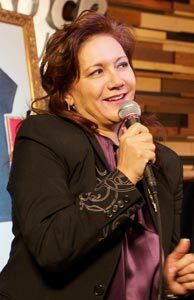 Featured guests included Janie L. Hendrix (President & CEO of Experience Hendrix, L.L.C. ; and Founder of Jimi Hendrix Park Foundation), Maisha Barnett (Project Manager, Jimi Hendrix Park Foundation), and Terry Johnson (Jimi Hendrix's childhood friend). If you missed the live broadcast, we encourage you to download the free recording (MP3 format). The Jimi Hendrix Park Foundation and Murase Associates have announced dates for their three public input meetings on the development of Jimi Hendrix Park. Each meeting will take place at the Northwest African American Museum, (2300 S. Massachusetts Street, Seattle, WA 98144). These public events are intended to engage the community and surrounding neighborhood in the development of the new Jimi Hendrix Park. We'd love to see you there! Seattle's Murase Associates have been unanimously approved as the Landscape Architects for the Jimi Hendrix Park development project. The Jimi Hendrix Park Foundation publishes a brochure outlining potential design elements that may be featured at Jimi Hendrix Park in Seattle, WA. The Friends of Jimi Hendrix Park formally adopts the operating name of Jimi Hendrix Park Foundation and is registered with the US Dept. of Treasury as a 501(c)(3) not-for-profit public charity. Donations that are contributed to the Jimi Hendrix Park Foundation are now fully tax deductible. EIN: 27-3599916. The Friends of Jimi Hendrix Park host a community Open House at the Northwest African American Museum in Seattle, WA. The Open House provided local residents with the opportunity to learn more about the development of Jimi Hendrix Park at 2400 S. Massachusetts Street in the Central District of Seattle, WA. The City of Seattle officially renames the recently completed 'Colman School Parking Lot Development' Project Jimi Hendrix Park in honor of the late 60's rock icon and his childhood ties to Seattle.